This week, we're thrilled to bring you a YouTube playlist about the most amazing kid. His name is Jake Barnett. 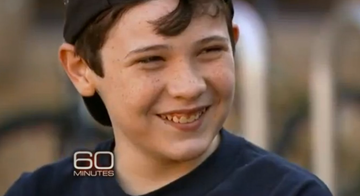 Maybe you saw Jake being profiled on 60 minutes, who did a story about the young math genius. Or maybe you saw his Ted Talk with over 4M views on YouTube. Or maybe you saw the viral video that started it all, with Jake writing math formulas on his window. On a personal note, I have a nephew who has Asberger's Syndrome, which is basically a mild form of Autism. And I see how hard my nephew struggles sometimes. So when I see Jake — with actual autism — get on stage and give a wonderful presentation, on stage at TED? Well to me, that is simply amazing. My hat is off to Jake. He's a real role model for kids all over the world, who are overcoming their own challenges. So with that...sit back, relax, and meet the inspiring Jake Barnett.